← Harrisburg, Pennsylvania. May 3rd, 2011. Danville, Pennsylvania. May 6th, 2011. 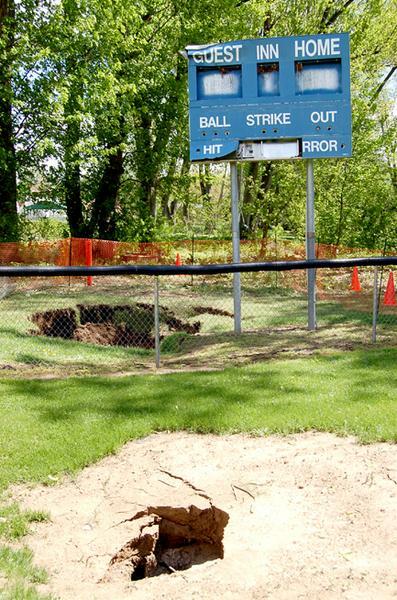 A massive sinkhole that opened up near Danville Little League’s t-ball field is not a threat to other fields, but officials do not yet know what caused it. Borough crews will feed a video camera into the drain pipe near the Washies Playground ballfield searching for structural damage. Graham would not speculate what else might cause a sinkhole but was confident the video feed would reveal the details. “Video should give us a real good idea,” Graham said. After determining the cause, the borough will excavate the hole and conduct any necessary repairs. Graham discussed the situation with the public works department today. The borough will not feed a camera into the pipe until they know there is no water in it, so the investigation may not start until next week. This early in the process, Graham did not have a specific work schedule for the project. In the meantime, the borough has surrounded the hole, and a significant portion of ground around it, with orange safety fencing. Moments after he was made aware and witnessed the sinkhole, Danville Little League’s Scott Shultz said there was a small hole inside the play area earlier this year. The grounds crew filled that hole, but this recent incident was a game-changer. The league won’t use the field until they can be sure it is safe. “We’re going to keep them off the field,” Shultz said. 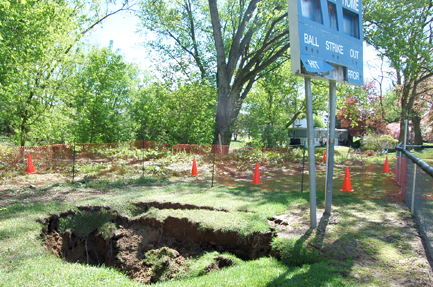 Both Graham and Shultz were not concerned that the sinkhole could grow beyond the fenced in area and affect any of the other fields at the playground. This entry was posted in Pictures and tagged Danville, Pennsylvania, sewer line, sewer pipe, sinkhole, t-ball. Bookmark the permalink. 1 Response to Danville, Pennsylvania. May 6th, 2011.